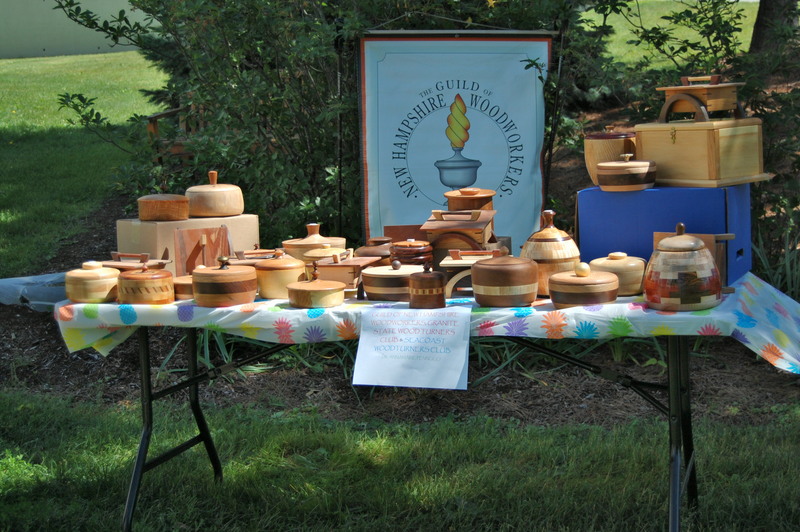 The Lidded Bowl and Box Project was invited to attend the CHaD Summer Block Party for kids and families currently admitted to CHaD or those returning from successful treatment there. On a warm and sunny June 19th, kids were able to choose, decorate and play with hand-turned spinning tops, thanks to contributions made by Chris Foss (16), Bruce Trull (12), Claude Dupuis (8) and anon (15). A collection of 25 or so tops were left for those kids hospitalized and unable to come down to the party. Thanks everyone, the tops were incredibly popular! The LB&B project also donated 35 lidded bowls and lidded boxes to CHaD, in hopes that seriously ill or severely injured children could have a keepsake or memory box in which to house their personal treasures. Unfortunately, CHaD Child Life Department only choose to accept 10 boxes. The remainder of the boxes, returned to the Guild, await distribution to other hospitals with similar pediatric Child Life support. The first of those other pediatric units is at Elliot Hospital and the the LB&B project has donated 8 of these boxes to their Child Life Department. Children admitted there face different but no less serious obstacles than kids at CHaD. Elliot serves children diagnosed with heart disease, gastrointestinal dysfunction, disorders of bone, blood or nervous systems, diabetes, influenza and pneumonia. The Child Life specialist at Elliot plans to distribute these boxes as a pilot project to determine how many boxes they can use on an annual basis. She hopes that all the boxes will find homes between now and Christmas. So do we! The LB&B project hopes to broaden the scope of its efforts and identify at least two other facilities that treat children with recurring or deleterious disease or injury. If you have any suggestions, send them in! Thanks! So. Back to work, everyone, the next pick-up of bowls and boxes will be at the Annual Guild Meeting on September 15, 2018. Merrimack High School and wood shop instructor Phil Carle will be hosting a Lidded Bowl and Box making Saturday in late September or early October. Hope to see you there!